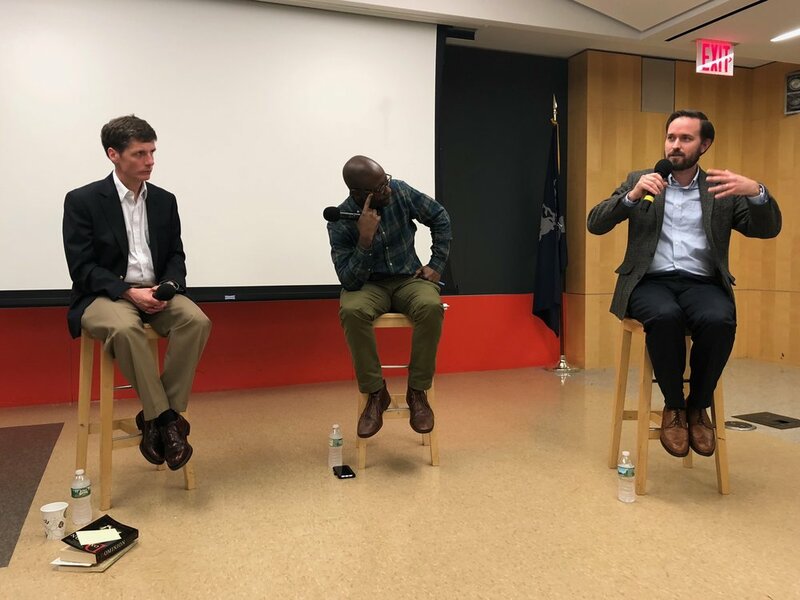 King’s hospitality club, Dele, recently hosted a panel to explore the questions surrounding animals and ethics, “Humane Hospitality and the Welfare of Animal Rights.” Dr. Anthony Bradley, Dr. David Tubbs, and Dr. David Talcott were invited to share their thoughts on the subject and explore how Christians should approach their diets. Anne Carman, the previous President of Dele, raised the questions: Is there a ‘right’ or ‘wrong’ way for Christians to approach animal welfare? Can Christians eat meat? Are they allowed to have animals products at all? If they choose to, what’s the best way to go about consuming animal products? What does the Bible say about this? Carman opened up the conversation to Bradley, Tubbs, and Talcott who dove into the conversation right away. First, the professors explained the changing nature of how consumers interact with food. “It wasn't too long ago where communities grew their own food. At the center of all of this was the church. They would get together as a community and trade off– they ate each other’s food. That lasted all the way through the 1980’s,” Bradley said. Tubbs mentioned that most people don't have to reflect on how their food is slaughtered, so they don't. Bradley also reminds us that this way of eating is a privilege, not a right. This might lead one to wonder what correlations exist between Christians and ethics within this context. Talcott shared that his family chooses a vegetarian diet for a majority of the time because they believe in the health benefits it provides, but not because he believes the Bible speaks against animal products. Talcott also brought up the end of the book of Jonah. He explained that God chose not to destroy the city of Nineveh, not only because of the souls, but also because of the cattle within the city. Tubbs got the audience chuckling with a story of a former student he taught who introduced him to her parents as “the professor who made her a vegetarian.” He, himself, is not a vegetarian; he believes Christians can eat meat, but they do need to be conscious about their consumption. “I eat meat, but I only eat meat that is organic, free range, or that my father has taken in the wild. The only deviation of this I take is if I am a guest in someone’s home and they are showing me hospitality. It would almost be downright rude to refuse,” Tubbs said. The professors concur that if Christians choose to use animal products, there are limitations. Meat should be consumed in a more thoughtful, conscious way. Bradley predicted that the “reducetarian” movement is going to be the next big thing in the animal welfare industry. This operation provokes participants to be very mindful regarding their animal consumption. To conclude the panel, Tubbs challenged everyone who eats meat to reflect on it periodically. He reiterated that pondering the process can lead to further reflection which is beneficial to all. 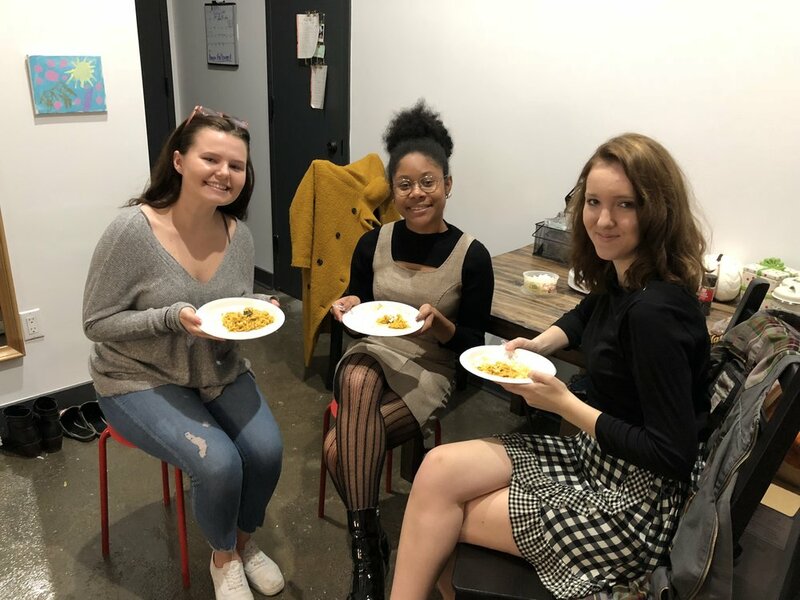 The following afternoon, Dele’s vice president, Sydney Watson, hosted a lunch to continue the conversation about both vegetarian and vegan diets. 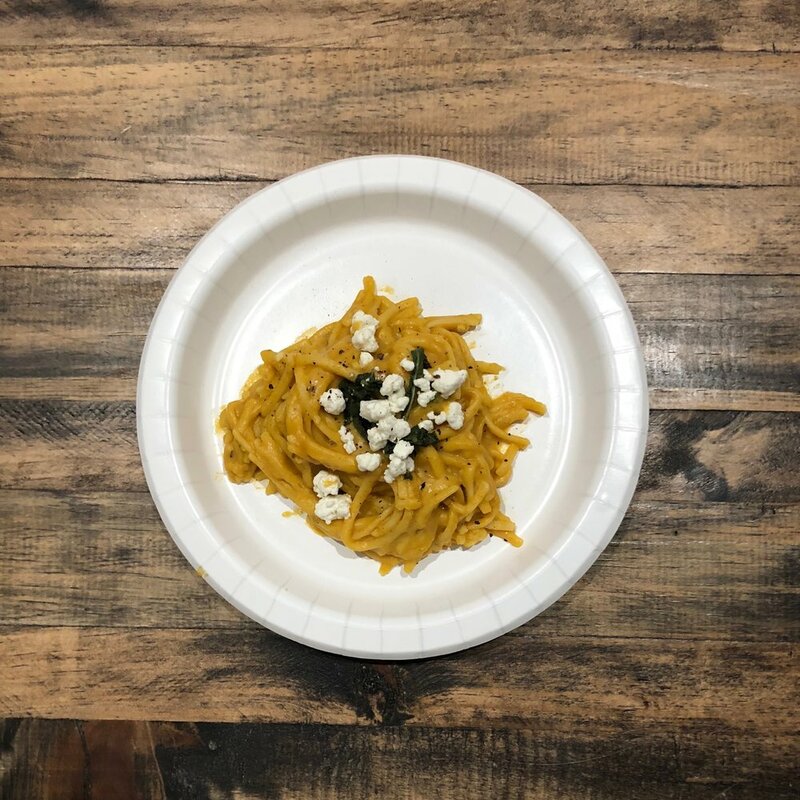 Her guests enjoyed a fall-inspired, pumpkin pasta dish garnished with sage, paired with goat cheese.